Suzanne Collins knows of what she writes in this story of a little girl whose beloved Daddy is sent away to war for a whole year. It happened to her in 1968 when he was sent to Vietnam. James Proimos’ illustrations show the wonder and confusion of a small girl and her understanding of the war. All she knows is that daddy is going to a jungle and it is okay because she knows jungles from cartoons. At night she dreams of flying to the jungle with her cat to see daddy. But how long is a year, really? For a child, it lasts forever. All the holidays come and go, but still daddy is not back. He sends postcards, sometimes. Then he sends a birthday card to the wrong child. The main character begins to understand how bad things must be at a war for a daddy to make such a huge mistake as getting the kids’ birthdays mixed up. 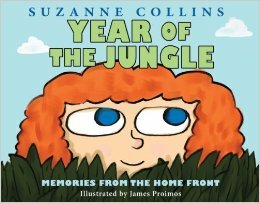 Suzanne shows clearly how the words a neighbor or news broadcaster say can change the child’s view of circumstances. The child becomes scared only when told to by what others around her say and do even when all of Daddy’s post cards are desperately trying to keep her days normal. When he comes home and she is still afraid, he tells that most soldiers do come home and Mommy is always with her. Her cat is a wonderfully stabilizing presence in the book and gives daddy a safe thing to write to her about. While this is supposedly a storybook for four year olds and older, it is also a story for grown- ups. It will help them to relate to children in clear and helpful ways. Maybe it is mostly for grown-ups to share with children who have a parent, grandparent or other close friend off at war. An important literacy skill that this book would help teach is the difference between reality and fantasy. How is a real jungle different from a cartoon jungle? It also illustrates the passage of time by using symbols of holidays. “Shamrocks, but no postcards. Colored eggs, no postcards.” Students could think of other symbols that represent particular times of the year. Also, the picture clues in this story are very relevant. Proimos uses the cat illustrations to help delineate the sizes of souvenirs that daddy sends. How big is the doll? Well, in the picture she stands eye to eye with the cat. The book could be used by middle school teachers and librarians as an introduction or example of writing an autobiography based on an early memory. This is a very moving and important book on many levels all about waiting and wondering and being okay.